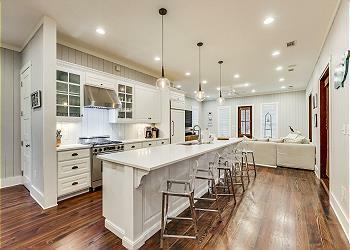 DETAILS: This large non-smoking custom-designed home is beautifully decorated and an awesome family retreat! The porches feature large sleeping swings that are perfect for an afternoon read, nap or drink. Step up onto a large open porch with plenty of comfortable and relaxing seating. Upon entering the home, you are invited in to an open floor plan that features beautiful hardwood floors throughout, accenting the living room, dining and kitchen areas, all of which are located on the first level. Comfortable seating fills the spacious living room and there is a television with DVD and stereo and also a wet bar. Opposite the living room is a fully appointed kitchen with granite countertops, stainless steel appliances, a center island and a breakfast bar that seats 5. Adjacent to the kitchen is a wonderful dining area. It features a large banquette table with plush window seating and chairs that overlook the front porch. There is also a convenient half bath located on this floor. The master bedroom is located on the first floor and is furnished with a king size bed, a flat screen television and plenty of bright airy windows. The master also has a private bath with a double vanity, a separate shower with a large shower seat and a Roman tub. Three spacious bedrooms are located on the second floor. The first bedroom features a king-size bed, a flat screen television and a walk-in closet. The private bath offers a double vanity, a separate shower with a large shower seat and a jetted tub. The second bedroom has 2 queen beds, a television, and attached bath with a single vanity and shower. The fantastic third bedroom on this floor has 2 sets of twin bunk beds, 2 full beds and a television. There is also a bath with a single vanity and shower with a seating area. Also located on the second floor is an open seating area featuring a comfy sofa, and TV. Enjoy the outside built-in grill area with table and umbrella area for seating. 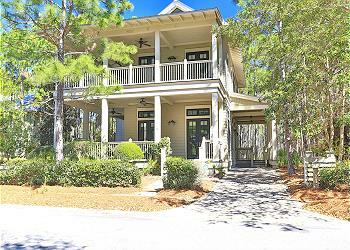 We’ve visited 30A for 19 years now and this is one of the best homes we’ve rented! It fit our needs perfectly and location is great with easy access to the new pool, basketball and Publix. All around great home!! We will be back! Absolutely love this home and Watercolor never disappoints! Thoroughly enjoy the bike rides to neighboring Seaside, wonderful restaurants options and most of all relaxing beachside gazing at the crystal blue waters of the Gulf. I highly recommend this home, it is phenomenal! We are so glad that you enjoyed your stay with us in Watercolor! We agree completely that this home is amazing for a fun beach getaway and the house bikes make the vacation that much more fun! We hope to be able to host you and your group again soon! This home is absolutely beautiful and the location fantastic! So much thought was put into every detail of this home. From the decor to the amenities, it was all amazing! Our family had an incredible time. It was the perfect beach getaway. Thank you for choosing 360 Blue. 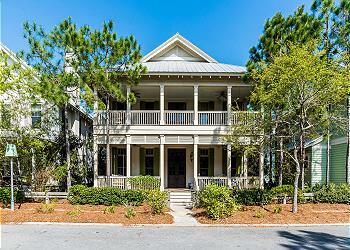 We are thrilled that your family enjoyed your time at the beach and in this beautiful home. We hope to see you back at the beach soon!